If you need to organise an event whether it’s a birthday party or a do for your work colleagues, then canapés can be the best option for food. Many catering companies offer high quality delicious and exotic canapés to serve and wow your guests while ensuring they don’t return home hungry. Canapés are always a classy way to spice up any event and they can be tailored to your tastes and needs. For example if you are having a themed party you can get food which suits the mood, such as a more French twist or American canapés. Equally, you can get canapés which will suit most palettes so your guests can all find something they like. 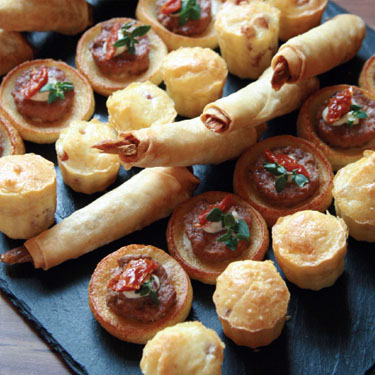 There is nothing like hot canapés to add some sophistication to your party or event. These, when ordered from the best catering companies, are always handmade and fresh so you can be sure of quality when you order. You can also order canapés which are made with locally sourced vegetables, fish and meat so that your food is ethically made as well as tasty. Canapés are the perfect way to impress your guest and there are so many to choose from when you are designing your menu. Whether you want classics like mini burgers or mini Yorkshire puddings, or something a bit more out there, you can find it. You can get canapés delivered to your door ready for your party up to two days in advance. All you need to do is then warm them up for ten minutes before your event and watch as everyone enjoys them. It is also possible to organise a butler when you organise your catering to serve the canapés to your guests. If you want to take the hassle out of the event you are organising you can order pre arranged and selected trays of canapés, such as fish canapés in a Plateau Marine or a more traditional English spread of canapés. Equally there are American style canapés which will include mini burgers, and of course French style for those looking for a continental taste. For those with more refined tastes there are canapés such as a Plateau Gormandise spread which includes mini croquet camemberts and other interesting choices. These are always delivered to you in a disposable box so it is easy to clear up afterwards. Canapes are great for small private parties whether you are celebrating an anniversary or a personal success. Equally, many companies use catering services when they are hosting events for staff or clients to add that extra impressive touch. You can also go the extra mile with a private party service if you want your guests to be looked after better at the event. This entry was posted in Cakes and pastry and tagged bread, canapes, pastry, yummy canapes on May 27, 2015 by Yami.